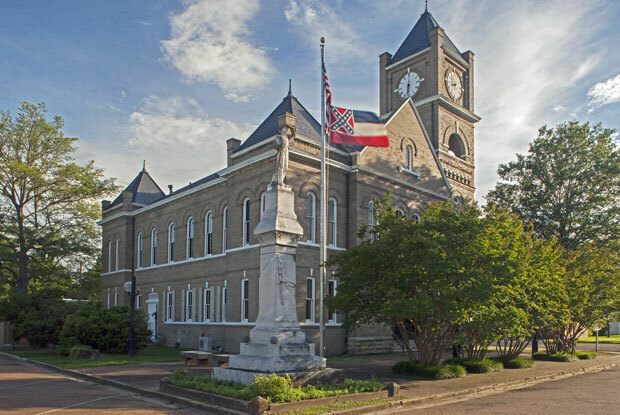 The courthouse in Sumner, Miss., where, in 1955, an all-white jury acquitted two white men in Till's murder. A debate rages in Mississippi over the state flag, which includes the Confederate flag. But it still flies at the courthouse. 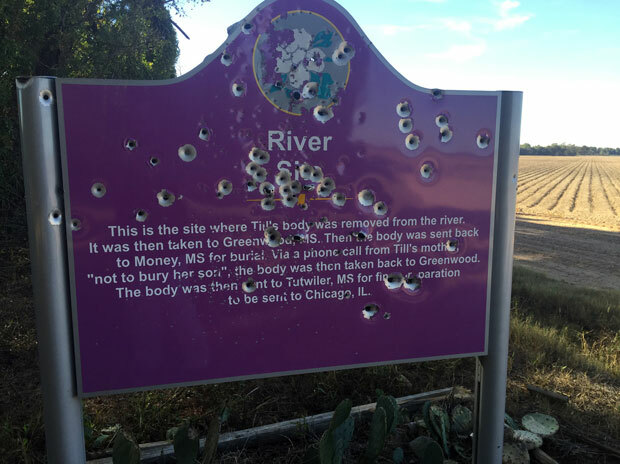 Bullet holes riddle the historical marker at the site where Emmett Till's body was pulled from the Tallahatchie River in the rural Mississippi Delta. It was 60 years ago this week that an all-white jury acquitted two white men in the murder of Emmett Till, a 14-year-old black boy visiting Mississippi from Chicago. The case shocked the nation — drawing attention to the brutal treatment of African-Americans in the Deep South, and the failure of the justice system. The men later confessed to killing Till for whistling at a white woman. Today, about 400 people live in Sumner, Miss., where the trial was held. The town sprouts up amid vast expanses of cotton land in the Mississippi Delta — the fertile northwest corner of the state. Sumner&apos;s town square looks a lot like it did 60 years ago. A bank on the corner, law offices and small businesses surround the Tallahatchie County courthouse, its clock tower looming above pink crape myrtle blossoms. Inside the courthouse, a dark wood stairwell leads to the second-floor courtroom, which is newly restored. "Exactly the way it looked in 1955," says Patrick Weems, director of the Emmett Till Interpretive Center here. He stands by the carved banister rail at the front of the courtroom. Twelve swiveling jury chairs to the left face the witness box. "Mose Wright would have stood up here and given his testimony," Weems says. "The famous question was, they said, &apos;Do you know the men who murdered Emmett Till?&apos; And he said, &apos;There they are.&apos; "
It was a dramatic moment. Never in anyone&apos;s memory had a black man in Mississippi confronted whites in court. Mose Wright was Emmett Till&apos;s great-uncle, who lived in the town of Money, 30 miles south of Sumner. Till was staying with him when the teenager made his fateful visit to Bryant&apos;s Grocery and spoke to Carol Bryant, the white woman at the counter. Her husband, Roy Bryant, and his half-brother, J.W. Milam, later kidnapped Till from Wright&apos;s home in the middle of the night. The boy was beaten, shot in the head and dumped in the Tallahatchie River, weighted down by a cotton gin fan. Till&apos;s mother held an open-casket funeral back in Chicago so the world could witness the disturbing images of her son&apos;s disfigured body. The resulting outrage drew unprecedented interest in the murder trial a month later. "I had never seen anything like it," says Mississippi state Sen. David Jordan, a college student at the time. "So many people in town. So much news and so much fear." Jordan and some classmates went to the trial, barely finding a seat in the sweltering and packed courtroom. They sat in the rear; the front seats were reserved for white people. Sitting in the back row again as the anniversary approached, Jordan recalls being struck by the relaxed nature of the defendants. During one recess, he says, one of their wives brought the children to play at the defense table, along with bottles of Coca-Cola. "Just going through a mockery — it was no justice or no seriousness as I could see on their faces," Jordan says, "because they all were laughing — even the jury were laughing." After a five-day trial, Bryant and Milam were acquitted. Jordan thinks it was no coincidence that the verdict came a year after the Supreme Court&apos;s landmark Brown v. Board of Education decision outlawing segregated public schools. "The state was set at a point. [It] had been said over and over that &apos;before niggers could go to school with white children, blood will run in the streets,&apos; " Jordan says. "This was evidence, in their mind I assume, that this is the example that the world can see that we mean business." "Mississippi in 1955 was just impossible for a situation like this," says Betty Pearson, who was 33 years old at the time. Pearson, the wife of a white plantation owner, and state Sen. Jordan are among the last living people who attended the Emmett Till murder trial. She says stores throughout the Mississippi Delta had set mason jars by their cash registers to raise money for the defense, and every lawyer in Sumner was representing Bryant and Milam. "To me it said that, OK, every white person in Tallahatchie County — if not in all of Mississippi — is a racist. And they&apos;re trying to defend these people," Pearson says. "And I knew that was not true." Pearson, now 93, says that after the trial she was stunned by the silence. "I never got one question from a single soul in Sumner," she says. "Their reaction to it was, if we just ignore it, it&apos;ll go away." The courthouse was remodeled in the 1970s, and up until about 10 years ago there was very little said about what transpired here. In 2007, Pearson joined a local biracial group that apologized to Till&apos;s family. Another member of the group, the Rev. Willie Williams, says that in the years since, they&apos;ve been working to restore the courthouse and foster reconciliation. "Reconciliation is the bridge," Williams says. But he says there&apos;s still work to be done to restore trust. Others believe the Till trial has been a stigma on Sumner that it didn&apos;t deserve; Till was murdered to the south in LeFlore County, but his body was discovered in Tallahatchie. John Whitten III practices law in Sumner. His late father was chief counsel for the defense in 1955. "We didn&apos;t do it. It didn&apos;t happen here," Whitten says. "This is something that was dragged in and left to rot in our courthouse." Whitten says that what happened here 60 years ago should never be denied, but that it also should not be honored. The state has created a historical trail to show how events, including the Till case, sparked the modern civil rights movement, and there&apos;s a marker here along the banks of the Tallahatchie where Till&apos;s body was pulled from the river. But confronting a fraught history has been an ongoing struggle in Mississippi. Today, that marker is riddled with bullet holes.